This exhibition of over forty paintings and accompanying archival material was organized by the Old Jail Art Center in Albany, Texas. It is the first to examine the work of Lucien Abrams (1870–1941), who contemplated subjects as diverse as Algerian watering holes, New England circus tents, and shady plazas in the American southwest. 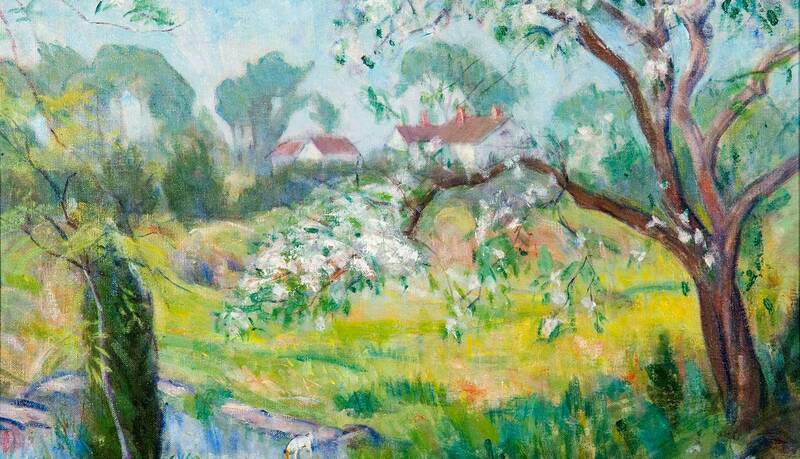 Abrams is an important figure in the Lyme Art Colony and the evolution of American Impressionism in the twentieth century. His work represents an attempt to maintain the vitality of such a key modern movement. Lucien Abrams: A Cosmopolitan in Connecticut will give viewers new found perspective on this well-educated, well-traveled man of art. Oil on canvas, 18 1/4 x 21 1/4 inches. Abrams’ exhibition record is impressive, yet his work is not widely know due the small number of his paintings in public collections. For this exhibition, guest curator Michael R. Grauer drew from both public and private collections to examine Abrams’ contribution to Texas Impressionism, and also the American and worldwide Impressionist movement. To tailor the show to Old Lyme, curators at the Florence Griswold Museum explored his deep connections to Old Lyme through paintings, diaries, and photographs borrowed from his family and works from the Museum’s own collection. “Abrams immersed himself in the community and these materials, carefully preserved by his family, help restore our sense of the home and friendships he made here,” says Curator Amy Kurtz Lansing. Fruit and Feather Flowers, N.D.
A native Kansan, Lucien Abrams moved to Dallas with his family in 1873. He studied at Princeton, the Art Students League of New York, and the Académie Julian in Paris, living and traveling in Europe and Algeria from 1894 until 1914. While Abrams’ style is diverse, the works he exhibited annually in Paris, and at the Art Institute of Chicago, the Pennsylvania Academy of the Fine Arts, and the National Academy of Design showed the influences of Impressionism, Post-Impressionism, and Fauvism. An admirer of Pierre-Auguste Renoir, Abrams pays homage to the Impressionist master in his painting, Déjeuner en Provence, ca. 1910 (on loan from the McNay Art Museum in San Antonio, Texas). 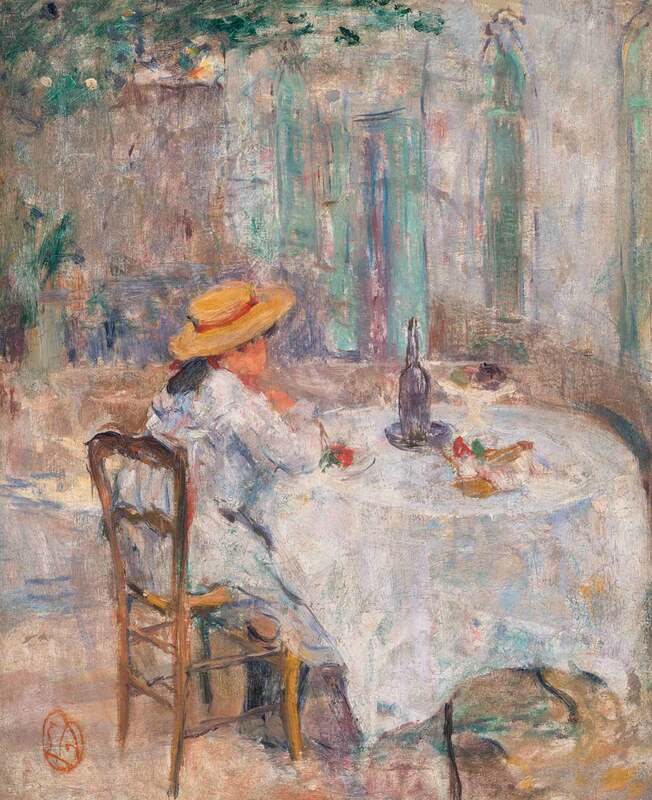 The depiction of a female figure in a casual patio setting thinly painted and sketchily defined by short brushstrokes, and using a high-keyed palette, distinguish it as an Impressionist painting. Oil on canvas. 24 q/8 x 19 3/4 inches. Abrams’ many paintings of his wife and/or daughter seated in chairs invite comparison to Paul Cézanne’s portraits of Madame Cézanne. 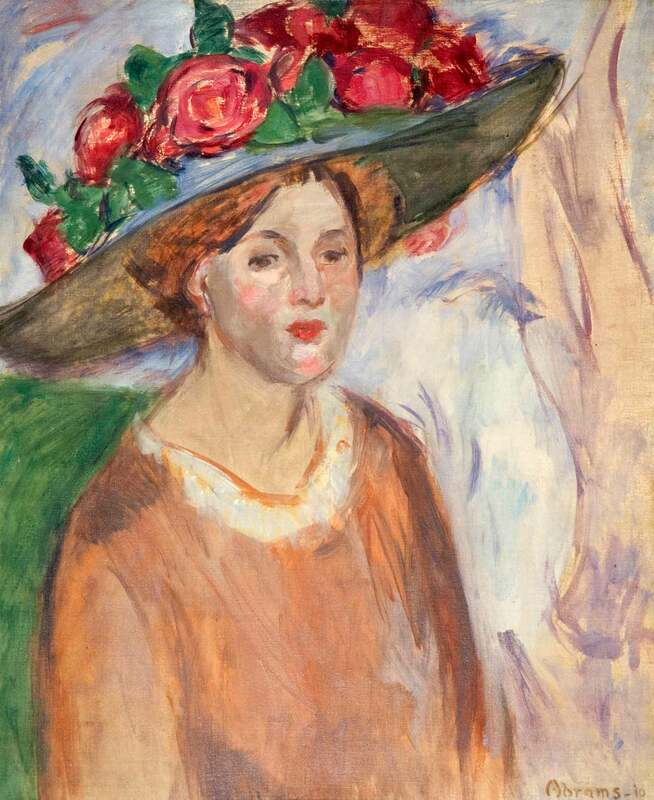 The loose handling of Femme au Chapeau and its muted color scheme echo this artist’s Post-Impressionist works. North Africa was a magnet for European artists during the nineteenth century. Like his French colleagues, Abrams gravitated to Algeria, where he made numerous paintings of the country’s architecture and people during a two-year stay in 1905-06. Kabyle Woman, ca. 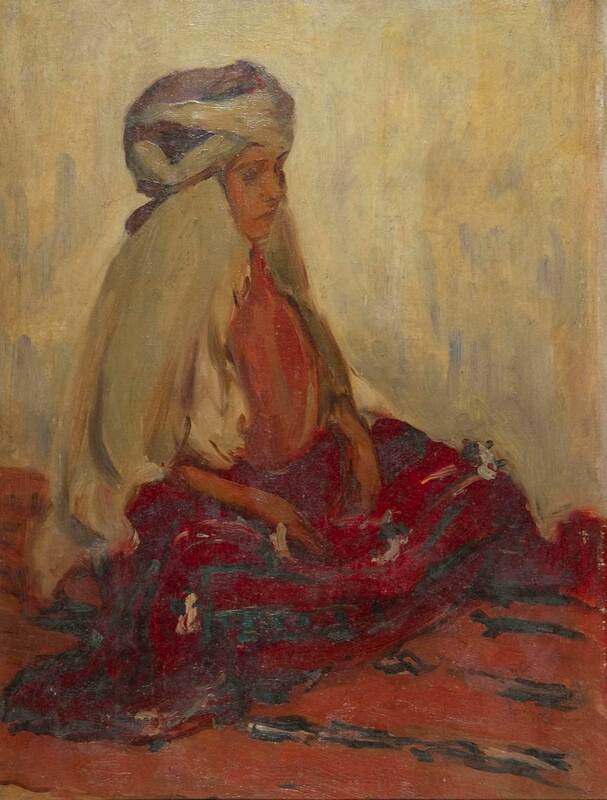 1906, depicts a member of one of the Berber groups in Algeria, shrouded in traditional fabrics. In his sketches and paintings, Abrams seems to have appreciated the almost abstract shapes into which these garments transformed their wearers. Oil on canvas, 28 7/8 x 23 7/8 inches. In 1914, Abrams began dividing his time between his family home in Dallas, a winter home in San Antonio, and a summer home in Old Lyme, Connecticut. The artist brought to the American Impressionism practiced in colonies such as the one in Old Lyme a greater awareness of succeeding European artistic movements, enlivening the aesthetic approach in a way that facilitated the embrace of a more modern sensibility by members of the colony. 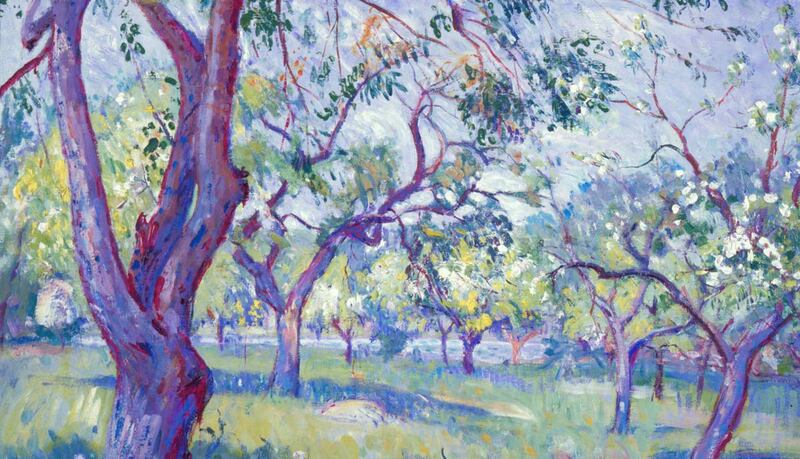 The Orchard (from the Florence Griswold Museum’s collection), depicting Florence Griswold’s property, reflects the influence of Fauvism on Abrams in his juxtaposition of reds and purples. Oil on wood panel, 13 11/16 x 10 7/16 inches. Untitled Landscape with White House a depiction of Abrams’ home on Johnnycake Hill imports the lessons of Matisse to Old Lyme in its sketchy articulation. While living in that home, Abrams and his wife would become active in the Lyme Art Association, where Abrams exhibited both earlier European works and canvases completed in Old Lyme. 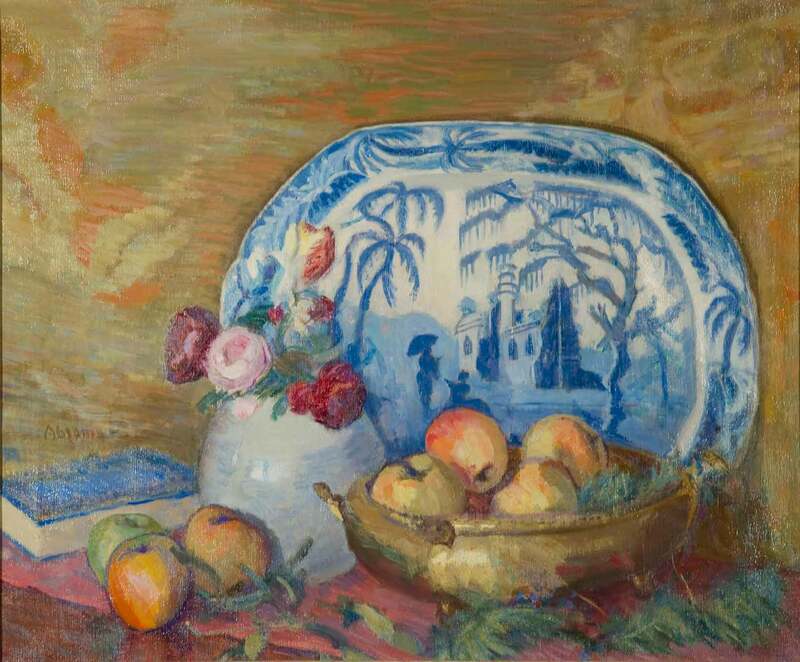 Some of his still lifes, based on floral arrangements his wife gathered from their garden, will be exhibited along with the vessels he used as props, collected in his foreign travels. The exhibition sheds light on Abrams’ life, travel, and impact on the practice of American Impressionism. His thorough familiarity with European art and life distinguished him from other Lyme Colony members whose European experiences were confined to a brief period of their lives. 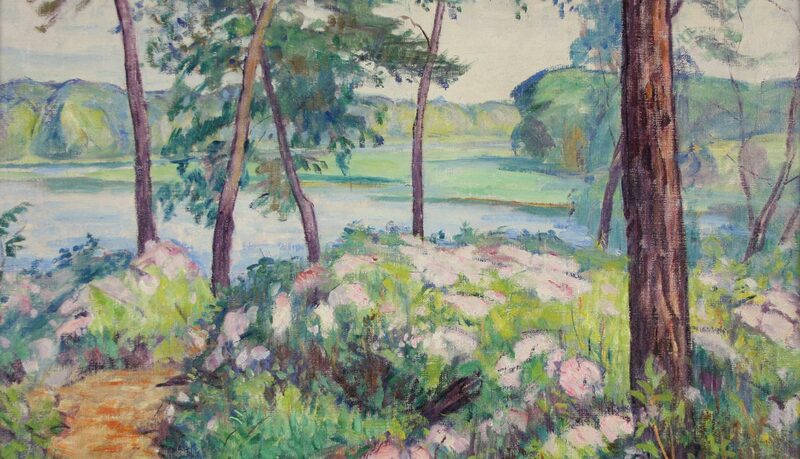 Abrams’ cosmopolitan outlook and aesthetic allowed him to infuse an updated appreciation for the modern into Impressionism in Old Lyme. As such, his presence stimulated the colony from 1914 until his death in 1941. Lieutenant River Near Old Lyme, N.D.
Oil on canvas, 24.5 x 29.125 inches. Oil on canvas, 26 1/8 x 32 1/8 inches. Untitles (Landscape With Trees, Pond, and White House), N.D.
Oil on canvas, 18 x 24 1/6 inches. A companion exhibition is also on view through June 1. 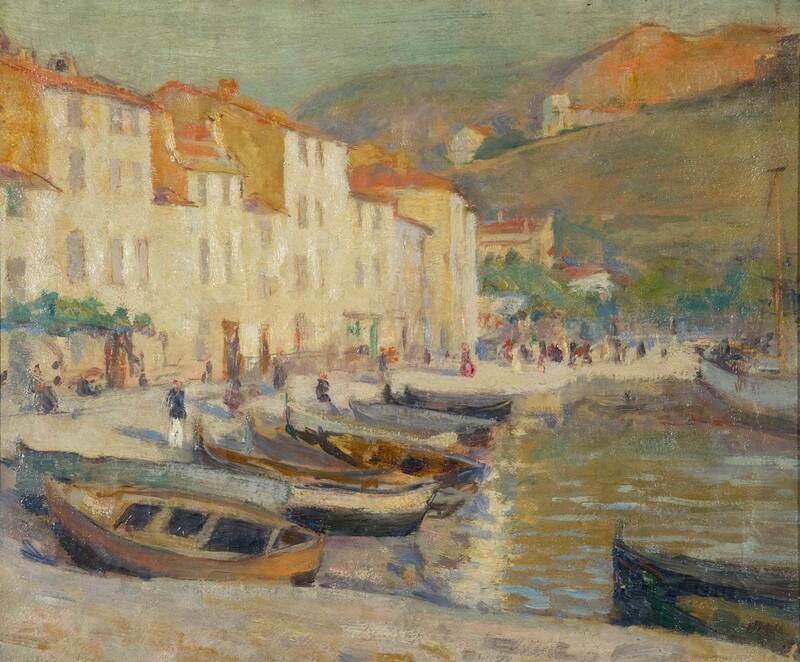 Lyme Artists Abroad, offers selections from the Museum’s permanent collection that establish a broader context for appreciating the world of artistic and cultural experiences sought by Lyme Art Colony painters. These artists traveled around the world capturing the beautiful, the exotic, and the unknown. They returned to Connecticut with a new sensibility reflecting the diverse people, places, and objects encountered.